Growing up in a country where there's no Thanksgiving celebration, I was at lost as to what to prepare when we first had our first Thanksgiving here in Texas. We relocated here from the Philippines a week before Thanksgiving Day in 2004, and though we were invited by a friend to celebrate with them, I decided to cook something that we can bring. I searched over the internet about what's usually served on a Thanksgiving feast, and though I wanted to be adventurous and try cooking a usual Thanksgiving dish, I opted to just make something that I'm used to prepare. 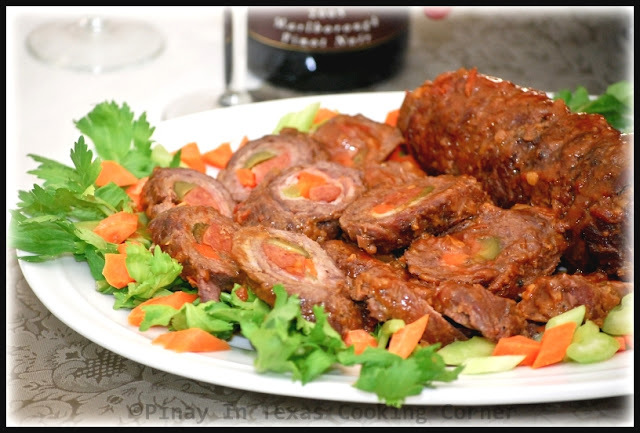 Beef Morcon, which is a favorite holiday food in the Philippines was one of them...and surprisingly, it was a hit not only to our friend's Filipino guests but also to the American ones! 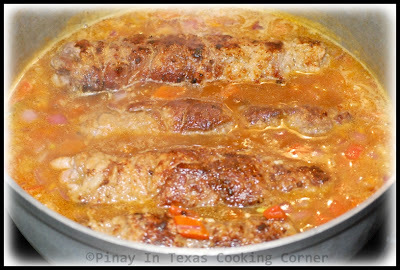 This will be the 8th time that we're celebrating Thanksgiving here, and though I've been preparing traditional American Thanksgiving food (like roast turkey, mashed potatoes & green bean casserole) since our second time, Beef Morcon is one of those Filipino food that I love making for Thanksgiving. I don't know if it's simply because it was my late Mom's favorite dish to cook for my birthday (which falls on Christmas Day) or it's my way of looking back to our first Thanksgiving celebration 7 years ago. Well I guess both are good reasons...but I must say that Beef Morcon is certainly a dish to love. 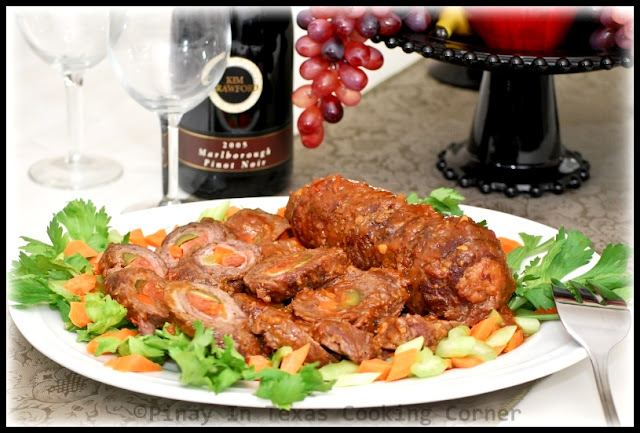 Let me share with you my Mom's Beef Morcon recipe that I altered a bit. You will find this dish irresistible, and you definitely won't regret if you'll make this a part of your Thanksgiving or Holiday feast. It's such a good addition to the usual star of the dinner table, Mr. Gobble Gobble Turkey. 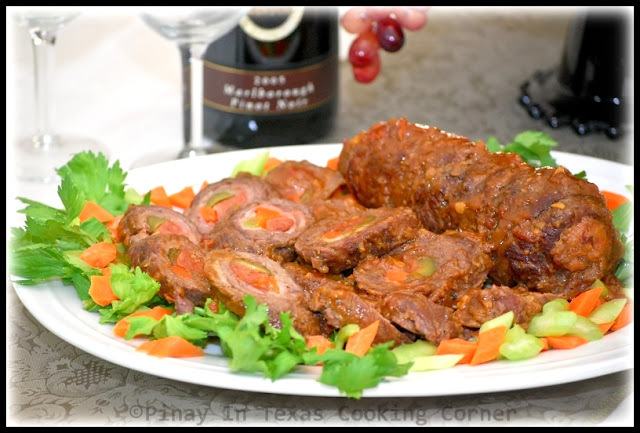 The best thing about Beef Morcon is that you can prepare it ahead of time! 1. 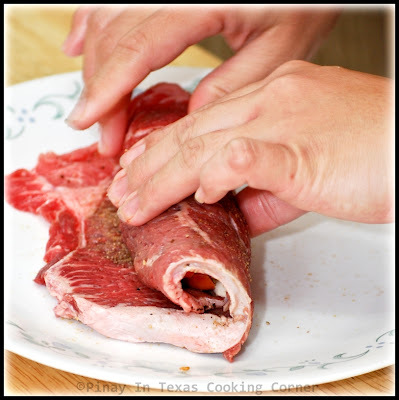 Slice the beef into thin sheets. Season with salt, pepper and garlic powder. 2. Wrap a quarter of carrot, celery, sausage and pickled cucumber with a slice of bacon. Put on one end of each slice of beef. Roll the beef, keeping the filling in the center. Tie with kitchen twine to ensure that the roll won't open up while cooking. 3. 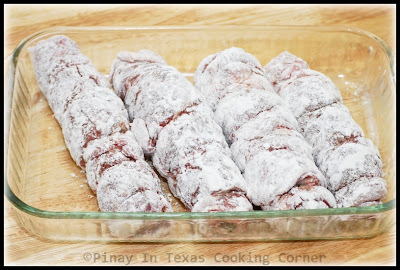 Dredge each beef roll in flour. In a big skillet over medium heat, fry rolls in vegetable oil until they are evenly light brown. Remove from pan and set aside. 4. In a large saucepan over medium heat, saute garlic, onions and tomatoes in 2 Tbsp oil (where you fried the rolls) for a minute. 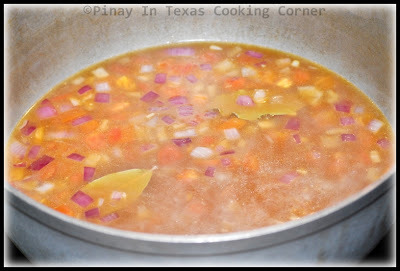 Add the stock, bay leaves, pineapple juice, soy sauce and tomato sauce. Mix well and bring to a boil. 5. Season with salt and pepper to suit your taste. Reduce heat to medium low. Add the beef rolls and simmer for about two hours or until tender. 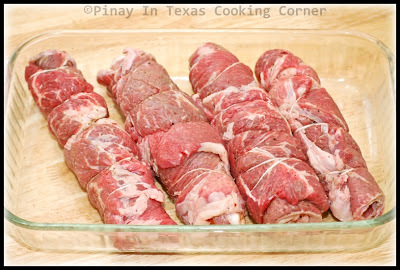 Remove beef rolls from saucepan and allow to cool down a little. 6. Meanwhile, strain the sauce and then simmer until thick. 7. Remove kitchen twine from the rolls. Cut into slices, approximately 1/2 inch thick and arrange on a serving plate. Pour sauce over the roll slices. Garnish with parsley flakes then serve. Awesome recipe, don't you think??? 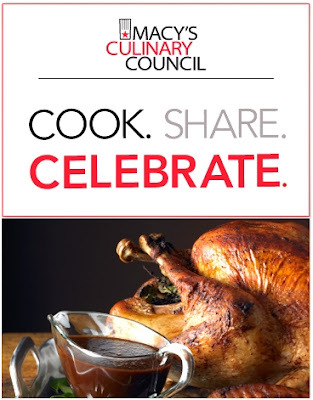 Aside from this, I want to share with you about Macy's Cook, Share, Celebrate campaign. Macy's is inviting you (both bloggers and non blogger foodies) to share your favorite holiday recipe and a holiday memory alongside with it at their Recipe Share Facebook Page!!! Two Foodie Favorites will be chosen by the editors of republic.com and will win a $1000 Macy's gift card, a signed copy of Marcus Samuelsson's "New American Table" cookbook and will have their recipe featured on Macy's Facebook page. Two Fan Favorites will be chosen by Macy's facebook fans and will win a signed copy of Marcus Samuelsson's "New American Table" cookbook and will have their recipe featured on Macy's Facebook page. Just leave a comment on this post. This giveaway will run until November 21, 2011, 9pm CST. One winner will be chosen via random.org and will be announced the next day. The winner can choose one prize from any of the three items mentioned above. 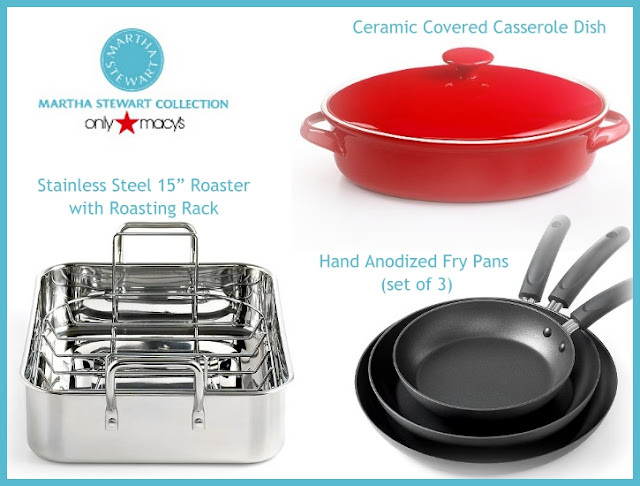 If the item chosen becomes unavailable, our friends at Macy's will be happy to offer another choice of a Martha Stewart Professional Cookware item (up to $40 in value). Thanks to all of you in advance for joining! Good luck! What a fabulous dish, Tina! Great for ANY holiday...so pretty and delish! Nice to have a memory of your mom as you celebrate Thanksgiving. And great giveaway, too! I HOPE I WIN!!! and I have to try this recipe. I've always wanted to try how to make morcon and I'm all into blogs/recipes with both the ingredients/instructions + pictures to show me how the outcome looks like..and this just looks oh-so-yummy!! Be sure to stop in at Cranberry Morning and enter my 5-Bar Handcrafted SOAP'n'SUCH GIVEAWAY. Ends Friday night at 10 PM. Beef dish looks perfect, nice giveaway. Great giveaway! I love rolled dishes, somehow they are always more fun. I would love to try this! What a interesting dish and I mean in a very good way! It's beautiful and I'm sure it's absolutely delicious with all those wonderful ingredients. Certainly something I would love to make if I weren't such a lazy cook. :) Who knows - I've been known to do strange things in the kitchen during the holiday. Great giveaway!!! This recipe sounds unique, special and delicious. You made the directions very easy to follow too. I may actually get up the nerve to try it! I'll let you know how it turns out! I saw this post earlier from my phone and I was drooling... what a delicious dish! 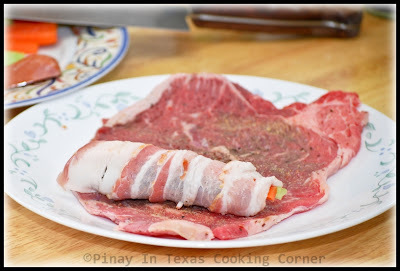 Wrapped in bacon and then beef? This is insanely delicious. I love the sauce you make and cook the meat in it too! YUM! This is such a great dish, I love the method of preparation as well as the final result. It is always fun to try new recipes! The beef looks so tasty with all those goodies rolled inside. Glad you posted this one. Also thank you for hosting such a great giveaway! What a awesome prize! Too bad I don't reside in US. Good luck to all the readers here! How exciting! I am making your egg pie today bec. I have been craving about it since last night and my oldest son loves it too! I have never heard of this dish but, I love that it evokes such happy memories for you. I love all of the ingredients and would love to try this. Can't go wrong with a pickle in my mind. Gosh, this looks absolutely delicious and I really like the method of preparation here. It totally reminds me of basic French cooking! Simple cooking and perfect results! This is so delicious...your recipe makes everything simplified, although I know it's an effort just to ake this yummy dish. Thanks for sharing. That's sounds delicious and the pictures are are great too, thanks for the share. now I know how to make morcon :-D yummy! so easy to follow and it turned out just like Mom makes it .. thank you! Looks extremely delicious, lovely photos too. Have a nice day. What a great recipe. I am going to make it as one of the entrees for our Christmas Eve dinner. Thank you so much for offering this awesome giveaway. Macy's is my favorite store for buying things for my kitchen and dining room. I would love to win any of the three items. My mom used to cook this for us during special occasions. She passed away 3 yrs. ago. To my regret, I didn't ask to have any of her delicious recipes especially for morcon. I'm so happy when I saw your posting today. I'd love to learn how to make this. Thanks. Whata great recipe. You make it look so easy. Great photos and step by step instructions. Thank you for sharing. Your beef morcon looks delicious...definitely a party pleaser! Great giveaway too! Love the giveaway! Good luck everyone! 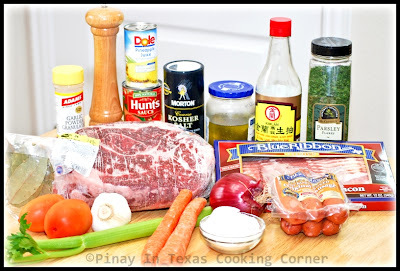 This is probably the easiest way to cook beef morcon. Maraming salamat sa recipe. That's a gorgeous dish! Thanks for sharing. 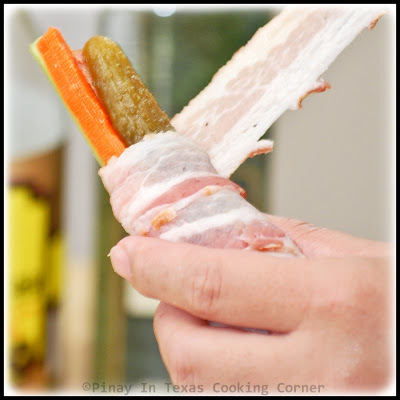 Love how you wrapped the carrots and pickles in bacon! Makes morcon all the more delicious! Have a great Thanksgiving, Tina! Oh how fun! I love Martha! And this delicious looking spread above with bacon and everything... now that's what I'd REALLY like to win - YUMMY! Thank you for this recipe.You always make it easy for the ones that are not an experienced cook with your step by step instructions and pictures.I'll be making my first morcon today! You're welcome! Glad to have you here!